Haven't seen any gameplay videos to post till now. Fortunately IdiotGamer has come to fill the void with another FC of the song Memory Lane by Forest Rain! Tridashie sure knows how to mix a good My Little Pony themed Christmas song and IdiotGamer sure knows how to FC one! Also, there is a regular gameplay by Schwifty Stardust after the break. Seeing gameplay videos come out has been real slow with only two so far, so I haven't had anything to feature. But hey, these two are still a start! Thank you to IdiotGamer and jimmjamme from making them! I have released an update to Notes From Magic. The new version is v1e. If you already have the game, just launch it and it should automatically update. Thank you to FlyingSixtySix for suggesting these changes on the forum. Notes From Magic beta release! 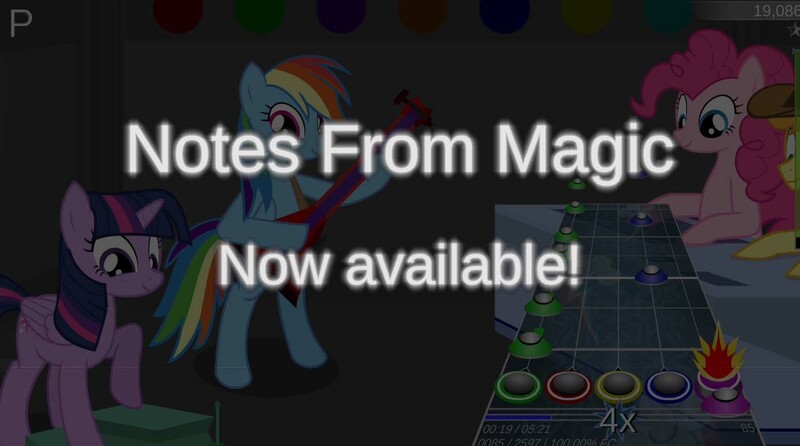 Notes From Magic is finally out as a public access beta! Early access beta release tomorrow!